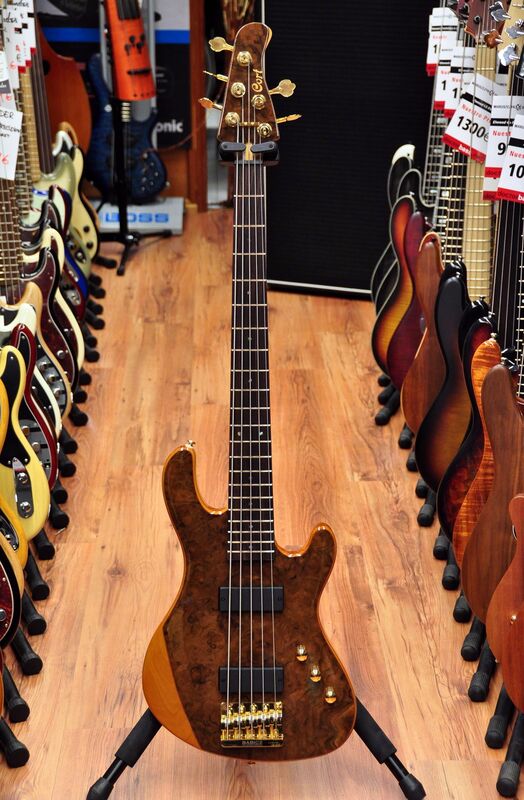 Signature model by Cort Guitars for bass extraordinaire Jeff Berlin. The whole idea behind this model was to produce a bass that would be lightweight and well balanced, would be extremely easy to set up and would of course sound first class, all of it at a price point that would not break your wallet. Have the guys at Cort succeeded? You bet. If you have followed Jeff's long carreer you will kwo he has never used exotic or ultra expensive basses. Quite the opposite. This proves that mid priced basses have really improved over the last few years and that if the instrument is well designed and the parts are well chosen, you can get a professional bass for very little money. Jeff Berlin went for the tried and tested formula of an alder body and bolt on maple neck with 21 frets over a rosewood fingerboard to get the sonic platform he wanted. Add an ultra solid bridge like the Babicz unit, Hipshopt Ultralight tuners for improved balanced and a set of custom Bartolini pickups handwound in the US. This bass is really easy to set up, and this is something that Jeff is particularly keen to point out. This is a working bassplayer instrument and a good set up is fundamental. No worries here as we take care of this and will set up. - Neck pickup: almost the opposite. Pseudo double bass quality. Ultra warm and deep. - Both pickups: scooped sound (due to the location of the pickups) that sounds like no other bass we've ever heard. Prefect for a lot of styles of music. The walnut burl top adds a touch of class and makes this bass look like a boutique bass less the price tag. The low B is remarkably good on this particular instrument. Loud and with bell definition. Remember that the scale is the traditional 34" so you get it all: comfort and performance. To sum up, a true working bassplayer's instrument that plays and sounds really good and has been designed by one of the living legends of bass guitar, all of it for a price that you won't believe.